I see him, Miss! He's super tall! I'll fetch him in no time at all. I got'im, Miss! I got'im, Miss! I KNEW that I could spot'im, Miss! ...THAT'S not a hippopotamus! 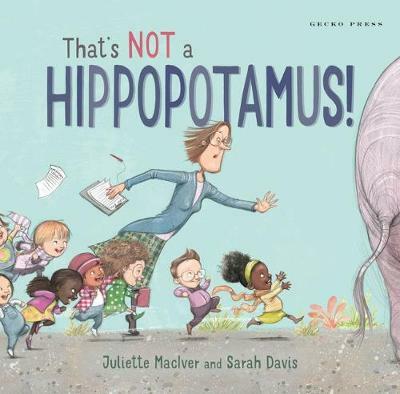 A class trip to the zoo descends into a chaotic hunt for the missing hippopotamus. Teacher, zookeeper and all the children join the search. The noise and drama reach a pitch, and no one thinks to listen to quiet Liam, who really might know where the hippo is hiding. 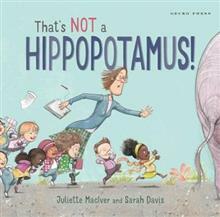 That's Not a Hippopotamus is a deft and delightful tale, packed with word play and madcap energy-and with a whole different story to enjoy in the illustrations. Juliette MacIver is a picture-book writer and mother of four, who lives in Wellington, New Zealand. Her popular books are regularly shortlisted for awards. Sarah Davis began illustrating picture books in 2008 and has illustrated more than 30 books. She is a leading illustrator with a wide portfolio of award-winning books. She has won and been shortlisted for numerous awards in Australia and New Zealand, including the 2009 Children's Book Council of Australia's Crichton Award for Best New Illustrator for her first picture book.